In this strange year for crops it appears that we are about to enjoy a bumper crop of chillies – a visit to the greenhouse reveals a veritable chilli forest, including healthy plants with flowers and fruit in abundance. None are ripe yet, but they are starting to change colour. I have been trialling varieties for a number of years now, and have finally identified ones that do well in my greenhouse here in west Wales. I only grow two*, both from The Real Seed Catalogue. The first is Lemon Drop – a slender fruit that ripens to a beautiful lemon yellow colour and has a reasonable amount of heat and a slightly citrus flavour. This variety is good for drying for use over the winter. The second is not, in fact, a different variety but a different species, it’s called Alberto’s Locoto (not sure of the scientific name). 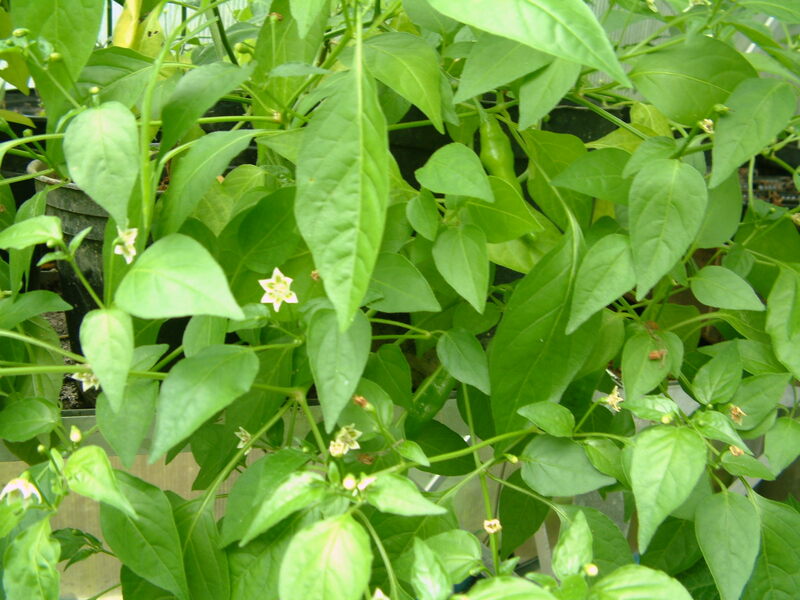 Alberto’s Locoto is a great plant – it’s a perennial and so you can keep it going for a number of years. When you do need more you can simply save seeds yourself – because it is a separate species, it doesn’t cross with any of the other capsicums and so it breeds true. It is a lovely plant – hairy leaves, purple flowers and bright red fruit when ripe. And finally, the chillies are good to eat – they reliably have a decent amount of heat, unlike some chillies I have grown in the past. Which reminds me… it’s worth noting that all capsicums/peppers/chillies are perennial and, with a little care, they will survive over the winter. Like many vegetables, we treat them as annuals and replant each year, but I have had some very successful crops of peppers in a second or even third year. You can either keep them in the greenhouse (as long as it doesn’t get too cold) or bring them into the house or conservatory (if you have one). Just keeping a couple going is worthwhile if you don’t have much indoor space, as they will crop earlier the following year than newly planted individuals. The milk for my weetabix the other morning was also too hot but a glass of chilled Sauvignon did the trick there as well! Strangely, the rest of the day is a blur. Chillies are nice but for me that have to be mild! I like a bit of heat plus some flavour – Alberto’s locoto are perfect for this… especially if you take the seeds out. It looks like you and I are the only people on WordPress to whom Lemon Drop means a chilli pepper (I was scanning the latest topics from the tags…elsewhere it’s a cocktail, a cupcake, or some sort of herbal concoction which I suspect my mother would have warned me against if she knew about such things). Top of my shopping list for next year is more Rocoto / Locoto / whatever it is seed. My home saved seed finally gave up the ghost. It is a really useful crop as you say – even I can put two or three in to a pot of chilli and it’s more than edible. *Plus* they look like Christmas lanterns and you can’t say that about a cabbage, can you? Well, everyone else doesn’t know what they are missing! I suspect that you could use it to make an interesting chilli vodka, but I rarely drink spirits, so I’ll be keeping mine for making curries, chillies and red hot kale! 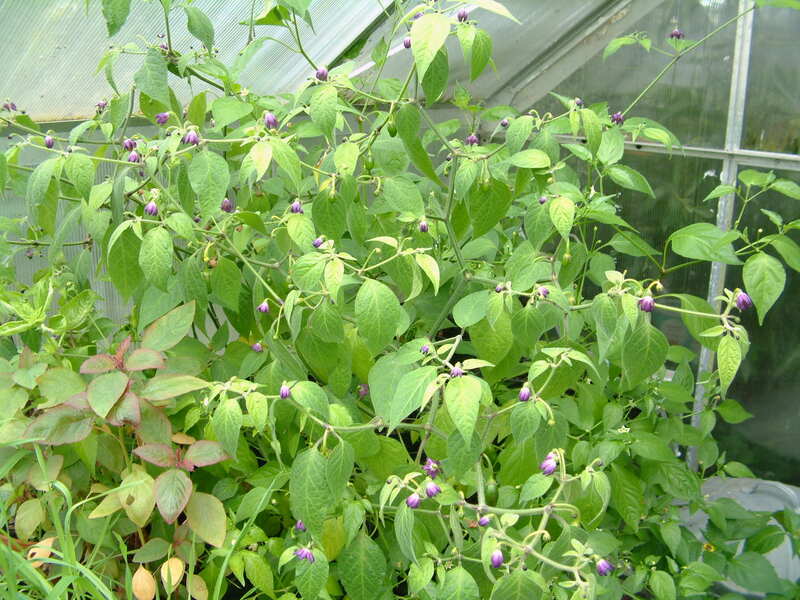 Hi Chris – I think the ‘rocoto/locoto’ chilli peppers are all the same – back seeds, purple flowers and hairy leaves. If this fits the description of yours, I think you have the same thing. As far as I know this is a distinct species and there are no named varieties, although there will be some variation between individual plants. Because it doesn’t cross with other chillis/peppers you can easily seed save, but also it’s a perennial, so the plant should survive the winter if you keep it indoors and flower and fruit again next year. I brought several plants into the house about a month ago and the fruits are ripening nicely.now. What size containers do you grow your Alberto’s Locoto plants in? I am growing them this year in 7-litre rose pots and I was wondering if the containers were large enough or whether I needed to go larger. Those should be more than fine – most of mine were in 3 litre pots last year. Hope yours do as well as ours – I overwintered some of them and they are perking up nicely now; plus, we are still eating them from last year. Thanks for the reply. I’ll let you know how they go. One of the plants already has five small fruits on it. I’ve been told that they are one of the best pubescens varieties to grow in the UK, as they fruit earlier than many of the others. I grew Red Rocoto last year and the plant didn’t start flowering properly and setting fruit until around July time. I had to bring it in over winter and the peppers (lots of them) finally ripened up in January/February 2013. I put the plant back outside in the garden yesterday, so fingers crossed there should be another good crop from that one too. Remember that if you want them to be hot it’s best to keep them fairly dry: once the fruits are well established, don’t water the plants until they wilt! Hopefully you will get loads of them this year.